​Opinion: Barrick stood up to MSCI ESG and no-one noticed. Originally published on 26 November 2018 on LinkedIn. September 2018 and Simon Jimenez, Senior Director at Barrick Gold Corporation stood up to the MSCI ESG report. Here he challenged the report published on Barrick, stating an array of errors, ranging from an incorrect name on the report to “substantive errors about our company governance”. I have been planning on writing this piece for a while. This should already be old news – widely debated – but it is not. This publication puts a finger where it hurts - but, in my opinion, it is more a cry-for-help. Most sustainability heads aim to produce better performance quality and better quality of disclosures. While the people on the “the other side of the spectrum”, the raters, do want to do a proper job reviewing the information provided. Why else have a career in the Environmental Social and Governance (ESG) space? For most people, working in ESG is not about having a nine to five job, it is about being part of something bigger and pushing an agenda further. According to Barrick, the type of errors range from basic errors in its company name to misunderstanding governance and the engagement (or implied lack thereof) on MSCI’s methodologies. It calls the resulting reports misleading. Let me start by saying that the three-page report by Barrick is a concise and detailed overview of the challenges faced by corporates when it comes to third-party ESG ratings. The report highlights some of the major challenges that ESG ratings face - although MSCI is in the spotlight here, this is far from being a unique situation. I will try to sum this up with a (non-exhaustive) top five - in my opinion, the latter one is the most vital one until we get the "rest right". Current truth: Although there is a push for standardized disclosures by standard-setters, the reality of it is that you do not really have to report in a specific format or in a specific location/report. Raters, therefore, have a hard time finding and comparing the information year-to-year, peer-to-peer or benchmarking in a sector. The data can be qualitative, quantitative or a combination. One year you use one metric, the other year another, as such, ESG analysts spent a significant amount of time cleaning the data up. Investors making clear demands for concise and comprehensive information on performance. However, in most cases, we get stuck at the simplest level of was it “disclosed or not disclosed”. Current truth: While more and more companies disclose ESG data, there are way more companies that do not. We might be at around 5,000 entities worldwide that have relatively robust and consistent data sets for a couple of years now - but that’s about it. This puts raters in a situation where they are either guessing or modeling. 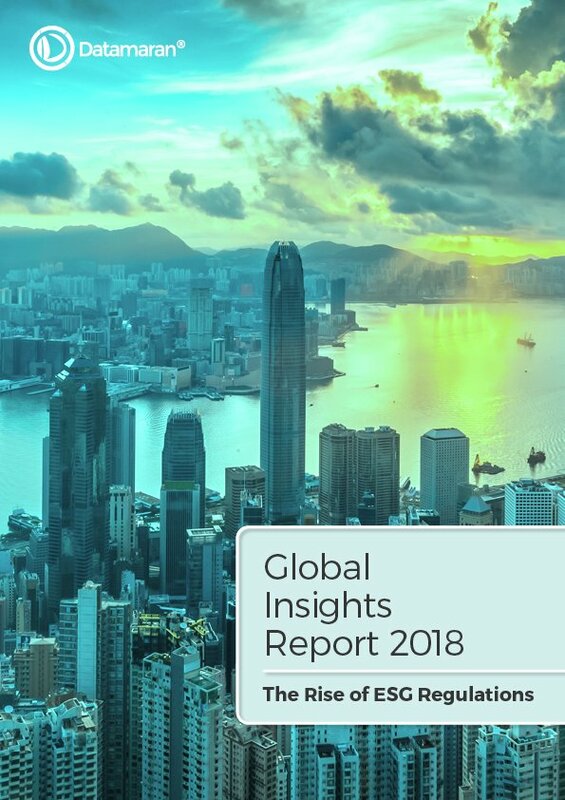 Datamaran’s recent Global Insights Report showed that for some sectors policymakers are taking a tougher stance on ESG issues, the three years alone ESG-related regulations grew by more than 100 percent across the United Kingdom (UK), The United States of America (US), and Canada. Some well known regulatory pressures from the public include The EU directive on Non-financial Reporting and High-Level Expert Group on Sustainable Finance. Private sector initiatives include the World Federation of Exchanges (WFE), COSO/WBCSD. Although all these are growing tremendously in number and in seriousness, many organizations are playing catch up. Although Barrick is choosing to have its ESG data verified/assured – this is not a straightforward marketplace either. Traditional accounting firms, like the Big Four, will offer assurance more closely aligned with financial reporting while boutique ESG consultants will argue to have more expert knowledge. Most companies – especially those in North-America – have not gotten started with this. Resultingly in raters making judgment calls here – and the differences in opinion and approaches will lead to different outcomes in ratings. Current truth: Although we are en route to mainstreaming ESG information, the fact that there is separate ESG reports, separate ESG ratings, separate ESG departments means we are not there yet. ESG is often a separate activity that is – mind you – not funded in the same way as “mainstream money-making business activity”. Analyst teams at MSCI and other raters might be growing, but most likely not sufficiently – especially considering the above three challenges alone. I am not talking so much of the famous “materiality matrix” here but more about the underlying processes to determine material issues. There is a big question mark around how and whether rating agencies are actually incorporating the notion of materiality in their company ratings. Not all ESG issues are equally relevant for each company or sector, and for this reason materiality has to take center stage in any rating or index. ​Where does this lead us? Let's wrap this up: this field is in development – a lot of progress has been made and we cannot afford to slow down. Perfection can easily become the enemy of the good. When applying “perfection”, we will probably throw the towel in and this is where I believe the opportunity lies for those that keep pushing. So, here is a call for ownership and pragmatism on both sides – and for seeking accountability and dialogue (like Simon Jimenez at Barrick decided to do with his piece). Corporates should continue to push their boundaries on providing good quality information in their reporting. Most importantly, the issues that corporates deem to be “material” should be backed by the serious business processes: e.g. board/senior management oversight or sign-off, integrated into risk management and corporate strategy, and accompanied by (a set of) metrics that measure performance “best”. Explicit language around how the materiality process works at the company level, who is involved from a governance standpoint and how this gets monitored, will help raters understand the seriousness of the company. Knowing that the decision-making process behind the metrics is solid, will help to build trust in the metrics provided. More transparency on methodologies will help companies understand what is being looked at and will allow both sides to have meaningful discussions on whether or not the right things are being assessed. Simultaneously, an understanding of how these methodologies are coming to be and how these are evaluated and adapted over time will help build trust. Clearly, raters that fail to incorporate materiality in their methodologies miss the mark – as box-ticking ratings overburden companies and are not capable of judging a company’s ESG performance. At Datamaran, we believe that using technology in this field contributes to solving some of these challenges. I will report this in my next blog on how, we believe, and where technology is already radically changing the way.